Our magnets are constructed of gloss white magnetic material available in 2 thicknesses. 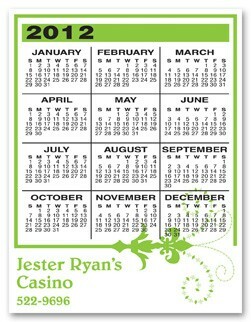 Calendar Magnets include full-color imprint with your choice of calendar design. Spanish calendars available in all styles. Specify year when ordering calendars.Thickness may vary slightly. Full-color printing (using the 4 process colors of cyan, magenta, yellow and black) is included in the price. PMS colors should be specified from the Pantone Solid to Process swatch book or Process swatch book. Neons and metallics are not available.